Creating this wreath is very easy! Start with steel ring. Loop May Arts 2.5″ Burlap Ribbon through the centre, outside and inside. Hot glue loops together, and to the ring. Continue this around the entire ring. This is coloured burlap is wired so adjusting the loops is easy and they stay put (filling in all the holes). Create a bow using the Bowdabra and May Arts Chevron twill. 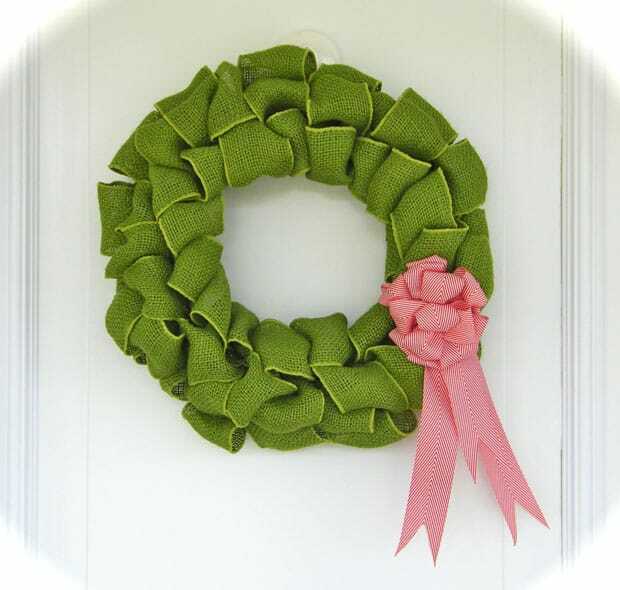 Attach with the bow wire to the wreath frame. 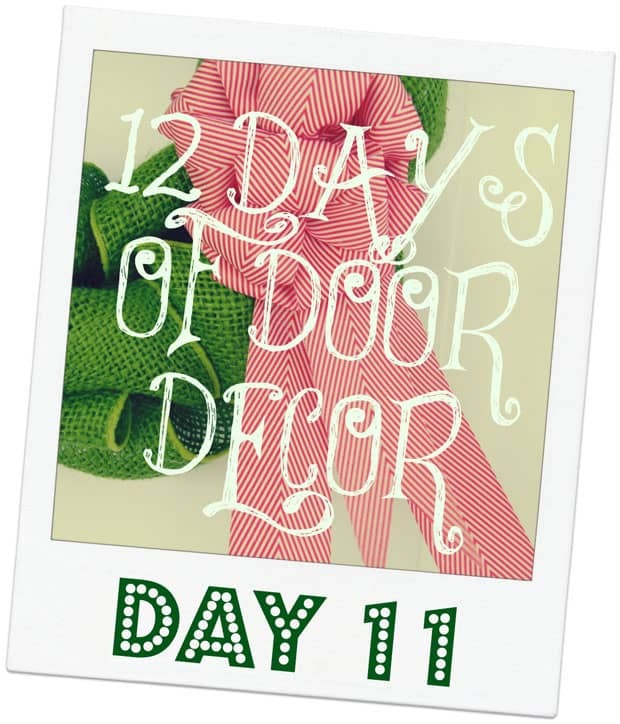 Day #11 is one of my favorites, I love the festive, vibrant colors. Which has been your favorite? Drop a line to let me know. See you tomorrow for the grand finale. This is adorable. 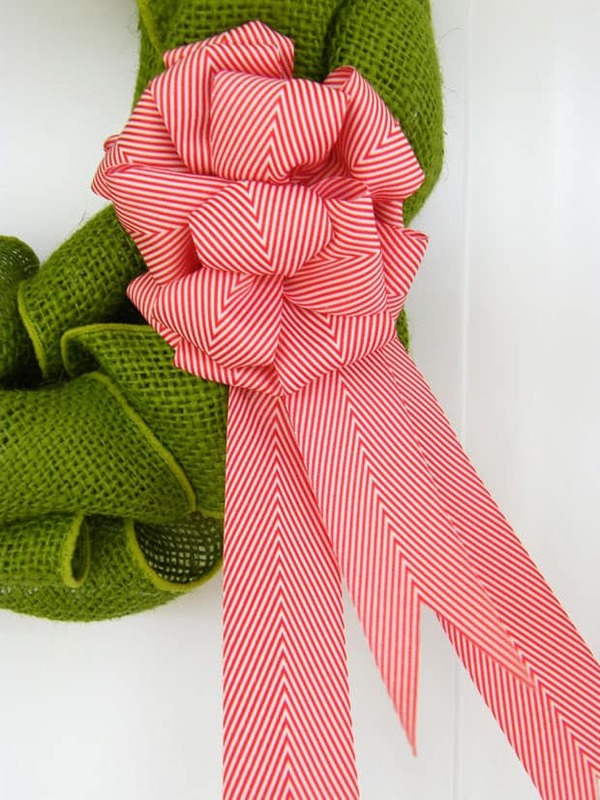 Curious, how much ribbon did you use for 1 wreath? I plan on making 4 so I’d like to know how much ribbon to order. Thanks! I used one spool of ribbon for each wreath, it is a 12″ ring. The bow was approx 4 meters of ribbon. I’m glad you like the idea! 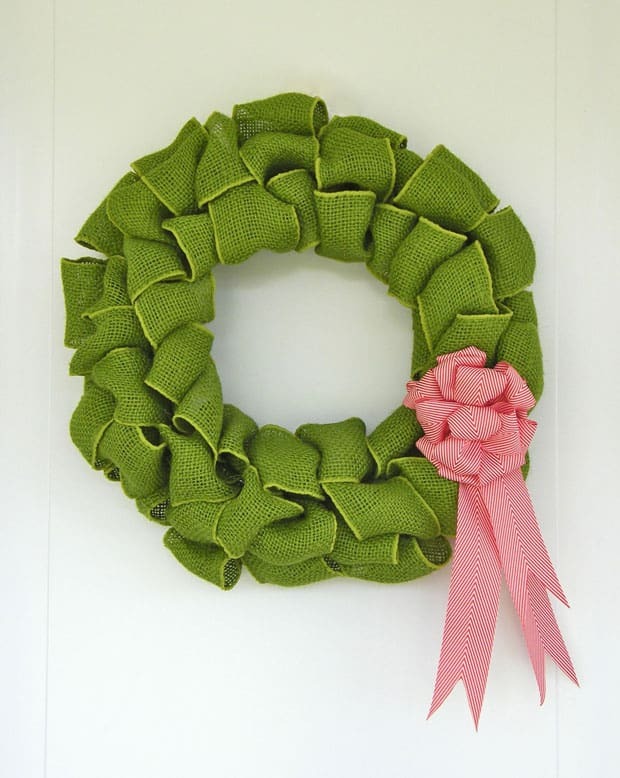 Love this and I’m planning on making it for my door to celebrate spring… Pink ribbon for Easter! You said one spool of ribbon per 12″ wreath frame. How much was on each spool? I found it online, but I have to order it per yard/meter. Wasn’t sure how much to order. 10 yards on a roll. I’d love to see your creation please link up on the Fynes Designs FB page when you’re done! Hi, I think the burlap wreaths are beautiful 🙂 However, I’m a little confused as how to make it. I see by the previous emails that you used 10 yards of burlap per 1 12″ ring. But when it comes to actually making the loops did you make one loop for the outside of the hoop,one loop for the inside, and one loop for the middle? Repeating all the way around the hoop? Thank you! You got it exactly right! Once I got the loops in place I used a piece of wire to sew through the loops. Good luck, would love to see your results!